I had the opportunity today to setup a studio shoot to do some table top work. My wife Denise had found these candies, pictured above, that she thought would make a really interesting photograph. She also has some other ideas that she thought we could do once we set everything up. 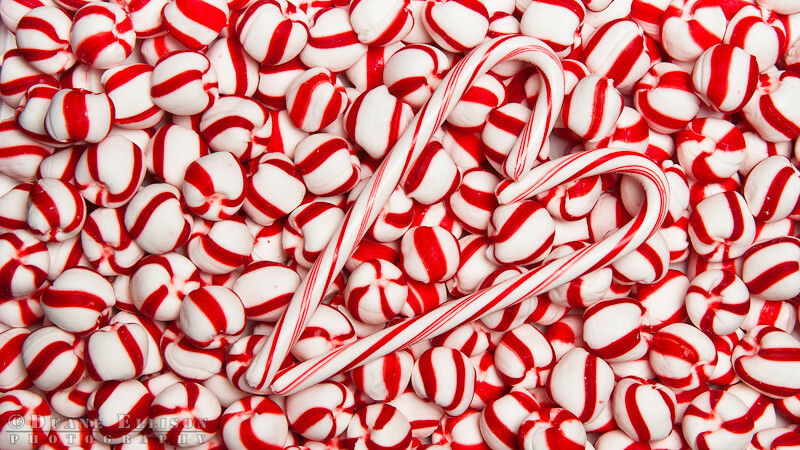 As you can see these particular peppermint candies are pretty darn colorful and kind of scream Christmas. We spent a bit of time building a little set and a mechanism to hold everything together. The key here was white foam core board, drum sticks (I know, it seems weird) and some painter’s take. This enabled us to keep everything in place while we setup and adjusted the shots. The lighting was fairly simple with an Alien Bee AB800 above the camera (in line) point down toward the items as a fill light lifted above with one of my trusty Matthews C-Stand. The main light was another Alien Bee AB800 attached with a clamp to the lower section of a regular light stand shooting through an umbrella about 8 feet away. We again utilized tethering to make ensure we were getting the shots we wanted while we were shooting!